A Default Group can be selected for all new tickets from email and the Customer Hub. This option can be found in your Admin settings. When an agent creates a new ticket, the user can select an initial group assignment. Click here for additional information on creating a new ticket. 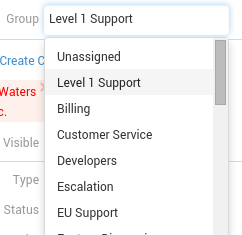 In the Customer record, a “Default Group” can be indicated. Any new ticket for this customer will be initially assigned to the default Group. Click here for more information on Customer settings. Ticket Automation can assign a ticket to a group based on specified conditions. Any user can reassign a ticket to another group from the My Tickets window using the “Assign Group” button under “More” on the top grid navigation. Your system is pre-configured with a list of groups. Click here to learn how to customize your list of groups.